Being a goblin isn’t easy–you’re small, runty, and green–and we can all agree, it’s not easy being green. Especially when there are many bigger, greener things that want to boss you around, shoot you out of catapults with glider wings strapped to your self, feed you to Squigs, or send you charging forward to get stuck on the enemy’s spears so they can charge in successfully. But goblins have a peculiar, spiteful sort of malicious resilience that keeps them hanging on and trying their best in the face of a world that’s full of terrors. Smaller than men and about as tall as Dwarfs, goblins are wiry amd have long, bony fingers with sharp claws. They have green skin, pointy ears, lots of sharp and pointy teeth, and red glowing eyes. They have unpleasant and shrill voices, and a childish and cruel sense of humour. 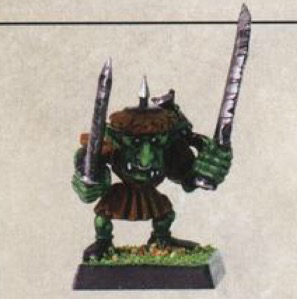 Goblins like to live in large groups and tend to be quite a cruel, sneaky, cowardly, and untrustworthy lot who like to attack with superiors numbers and, if possible, from a distance. As such they are good archers but rather poor fighters. They steal or loot anything they can from anyone and destroy anything they can’t carry just for the fun of it. They live in countless tribes, the majority mixed with Orcs. The Goblins are slaves and servants of their larger and stronger relatives. Some tribes are composed only of Goblins, led by an overbearing Goblin Boss. Some of the leaders become quite powerful, leading several tribes and the most successful among them even manage to lead their own Waaaghs! They also suffer a complete lack of personal hygiene. There are many different kinds of goblins out there. Probably too many for the Chroniclers of the Empire to keep track of all of them, but the more successful, if you can call it that, tribes have been noted, and are thorns in the side of many a citizen. With a love of fungus, insanity, and squigs, these are the roots of the Moonclan Grots. Night Goblins are a Goblin sub-breed. They live inside the mountains of the Old World. Night Goblins dress predominately in black, and will only come out into the sunlight when they are suitably reinforced by considerable amounts of fungusbeer. 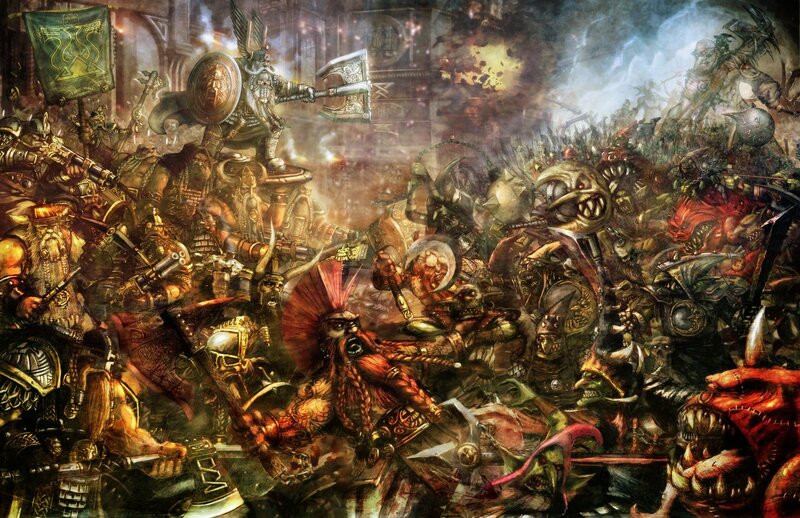 They spend the majority of their time fighting each other, Dwarfs, and/or Skaven, as all three species compete for the same territories. 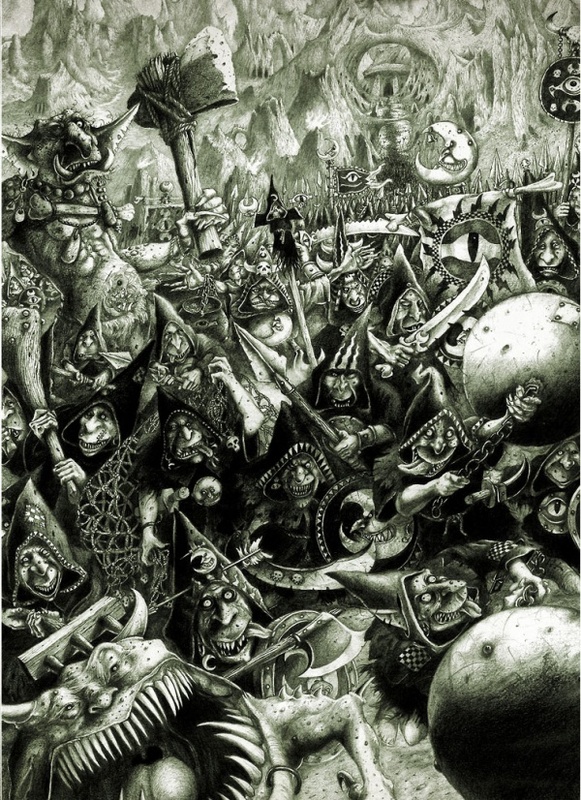 The Night Goblins have had considerable success in their battles with the Dwarfs, having even conquered a portion of Karak Eight Peaks, the most ancient and awe-inspiring Dwarf hold. 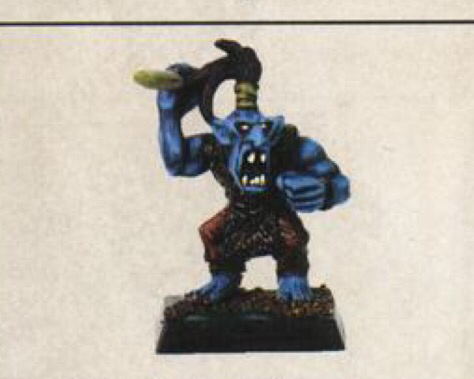 The Night Goblins make extensive use of Squigs in battle, being one of the few creatures beneath the World’s Edge Mountains whom the goblins can tame (somewhat) effectively. These squigs are either herded towards the enemy, or in the case of the most hard-case gobbos, ridden into battle. Night goblins that have drunk the infamous fungus beer become abnormally strong and lug into battle a huge ball and chain, these madcap goblins are called Night Goblin Fanatics. And here we have the inspiration for the Spiderfang Grots, who worship spiders and love poisons. Forest Goblins are a breed of Goblins who live in the forests. Divided into several tribes and hidden in deep forests, Forest Goblins are always eager to raid and pillage isolated farms, villages, and sometimes even cities. They decorate themselves with large colourful feathers, which are used in certain combinations to distinguish tribesmen from foreigners. They also use warpaints, bones, and teeth as decoration. As metal ores are lacking in the forests, Forest Goblins usually wield weapons made of wood, bone, and rock. Some weapons and armour made of iron or steel might be traded and bartered from other Goblin or even Orc tribes. Spiders have a very important role in the culture and daily life of the tribes. Small and succulent Spiders are eaten, while others are kept as pets. Large horse-sized spiders are ridden as warmounts and small poisonous spiders are used by the tribal shamans. A shaman will put these spiders inside his mouth so that the spiders bite him on the tongue. The poisons will drive the shaman a bit mad but also stimulate the part of his brain that controls magic. Being a goblin isn’t an easy lot, to be certain. You’re among the smallest and the weakest creatures in the world; being a Gnoblar is to be a goblin to other goblins. Gnoblar is a small, weak and altogether stupid form of Goblin. They are usually kept as servants/pets/slaves to the Ogres of the Mountains of Mourn. An archetypal Gnoblar is usually very small (a foot shorter than a common Goblin), with thin limbs, and a disproportionately large nose and ears on his head. The most powerful Gnoblar in recent memory was the Great-King-Lord Bezer. Being possessed of a huge dripping nose, flapping ears and an intellect far beyond that of his peers, Bezer quickly became Overtyrant Greasus Goldtooth‘s favourite Gnoblar. After arranging the death of his rivals for Goldtooth’s favour (instigating a fight in the Overtyrants larder, delaying his third breakfast), Bezer used his cunning mind (for a Gnoblar) to forge an empire of two and a half Gnoblar tribes. Bezer’s empire crumbled overnight, however, when the Great-King-Lord was crushed by his owner, who fell on him while drunk. Fire Kobolds are Goblins native to the volcanic Red Cloud Mountains that lie south of the badlands and other volcanic regions around the globe. Although Fire Kobolds have a greenish skin tone, they are covered in patches of deep red or orange tones. In fact, at first glance they just look like Goblins which have some type of horrific skin disease, fungus infestation or blotches of red war paint covering them. Reports have suggested that these Goblinoids spit small wads of burning flame as a brutal and natural defence mechanism, though others have reported that they simply make extensive use of flaming arrows and weapons. At the same time, fire based weapons seem to have little or no effect at all on these Kobolds, which would suggest that their volcanic environment has had a profound effect on this particular species. 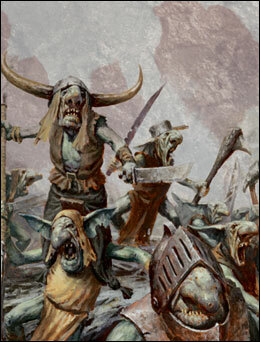 Troglagobs are one of the most unusual types of Goblins. They dwell near the sea, making coastal raids against the Empire, Tilea and even raiding the shores of Ulthain and Lustria. Recently, many of these ocean dwelling Goblins have been sighted in Albion in great numbers, in the muddy souther tip of the island that has come to be known as Trogland. Hill Goblins, also known as Great Goblins, are a particularly large breed of Goblinoid native to the grassy hills of the Badlands. South of the Empire, across the shores of Tilea and the Border Princes, lies a barren plain of hills and grasslands at the very edge of the Badlands. It is in this deserted region where the largest Goblins can be found. Generally reckoned as Hill Goblins, but also known as Great Goblins, these Goblinoids are larger than ordinary Goblins, more aggressive and can be as strong as a common Orc. The skin tone of a Hill Goblin is much darker than that of a common Goblin, with some shades even resembling that of a Black Orcs hide. 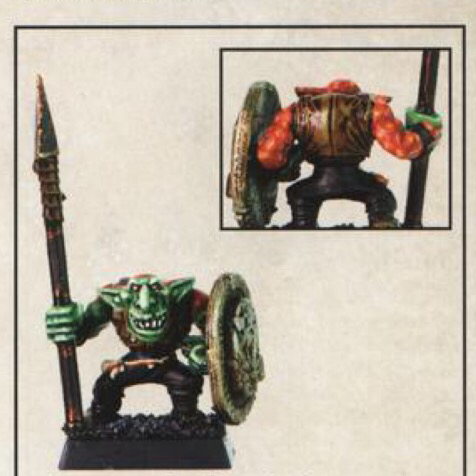 Being much more brutal and ambitious than their lesser cousins, these Great Goblins enjoy fighting almost as much as orcs do and will occasionaly sell their services as mercenaries to armies that will put up with them. So many goblins out there–and that’s not even counting the infamous Dust Goblins–necromantic fiends brought back to life in the deserts of Khemri. 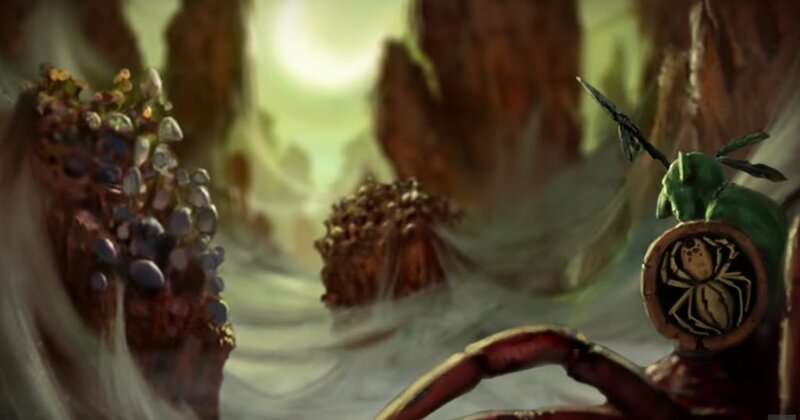 Who knows maybe one day we’ll see a horde of them join Nagash’s ranks? In the meantime, which goblins are the best goblins? Let us know in the comments!